The elder boy fixed me with a piercing stare that seemed to penetrate every cell of my body and said vehemently, “There’s nothing wrong with plucking a bird. What is wrong is that a woman like you should be walking around off the leash in mixed company without a head covering. Dr. Wafa Sultan saw Islam up close as she was born into a devote Muslim family in Baniyas, Syria. 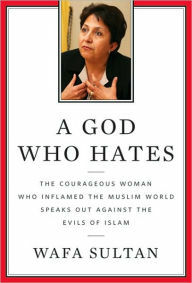 She has written her life story as witness to the nature of Islam’s god – Allah – a god who, Dr. Sultan says, hates women and she makes her point well by quoting both from the Quran and Hadiths. * She reveals Muhammad’s character, his deeds, and words and shares from first hand experiences his influence on Muslim men (and young boys) and how they treat women today. The story of Muhammad’s marriage to Aisha has a further and more horrifying effect on the relationship between Muslim men and women. In the story of the marriage, Muhammad pounced upon the nine-year old Aisha the moment her mother placed her in his arms on a bed in her own home. Through the story of this “marriage,” Islam denies women the right to read the stage of physical, intellectual, and emotional maturity at which they are fully ready to marry. It denies Muslim women the right to marry as a rational human being. That a girl should jump from her swing and become within a few minutes a mature woman in the arms of a man – this is something the most basic law of morality cannot accept. The great misfortune is that his incident has been sanctioned by both religious and secular law and has become a way of life. This is a difficult read as her first hand knowledge of unimaginable cruelty that woman suffer in Islamic society is inconceivable to most of us who live in the West. Dr. Sultan shares story upon story of young girls (her niece** among them) whose childhoods are violated in the Islamic world. As well as her focus on the plight of women, Wafa Sultan touches on the broader scope of Muslim belief. If you have ever looked at ongoing events in the Middle East and thought, “I just don’t get it!”, this book will help you to better understand the mindset of Islamic society. Dr. Sultan is a woman trying to get her message out – not just to the West – but the Muslim world also. Her message is one that needs to be heard – especially in a world that is so blinded by political correctness. This is a raw and honest read, written by a very courageous woman. I receive death threats on a daily basis. I’m a well-known writer in the Arab world. My writings expose me to millions of devout Muslims who have nothing positive to prove but the sheer cruelty of their teachings. Islam has deprived them of their intellectual ability to face criticism in an effective and acceptable way. Being born and raised as a Muslim has helped me to realize how serious these threats are. While I try to not let the threats interfere with my mission, at the same time I don’t ignore them either. Prior to the release of my book, “A God Who Hates,” I was forced to go into hiding. It hasn’t been easy, but since I believe in my mission, nothing will deter me from accomplishing my objective. In a world that seems to be in a moral decline, A God Who Hates, is an important and much needed read. * A collection of sayings of the prophet Muhammad that, with accounts of his daily practice, constitute the major source of guidance for Muslims apart from the Quran. ** Dr. Sultan shares how her 10 year old niece was made to marry a man of 40. She ran away time and time again to her father’s house but under pressure from her family would return. Seeing no other way out, her niece committed suicide at age 26. I just purchased this book for my kindle, glad to read your review. I was very difficult for me to read but I think believers need to read this. My compassion for those trapped in islam has actually grown. what a brave woman to speak out so honestly. thank you for the review and interview even though it is chilling.